The Wadi Faynan Project of the British Institute at Amman for Archaeology and History has as its principal objective the provision of a detailed case study in the relationship between environmental change and human history in the arid zone from prehistory to the present day. The principal area of interest is the confluence of three wadis; the Ghuwayr -- Shayqar and Dana which merge to form the Faynan. The Wadi Faynan was selected by BIAAH as the case study for three principal reasons. First is the fact that it is a typical desertic region in terms of its climate, environment and landforms. The second reason for the selection of the region was that the wadi has long been known for a remarkable suite of archaeological remains (Glueck 1935; Lagrange 1898; Musil 1907), indicating a variety of levels of intensity of human exploitation from prehistoric to recent times. The evidence included a suite of settlement and burial sites from the neolithic (Najjar et al 1990) to the Islamic periods (King 1989). The complex is dominated by the major site of Khirbat Faynan ('the Ruin of Faynan') on a hill overlooking the wadi confluence. As he travelled down the Wadi Faynan following his visit to Khirbat Faynan, Glueck noted "large stretches of formerly cultivated fields . . . strewn with Nabataean sherds" (1935, 35). These fields were marked out by boulder walls and stretched for several kilometres down-wadi along the south side of the wadi floor from the confluence. Several commentators noted that the surface pottery included much Roman and Byzantine as well as Nabataean material, suggesting a long history of ancient cultivation, presumed to be primarily in support of the population of Khirbat Faynan. The area is also extremely rich in minerals and extensive research in recent years, especially by the Bochum Mining Museum, has demonstrated a rich prehistory and history of mineral extraction and exploitation (Adams 1991; Hauptmann 1989 and 1992; Hauptmarun et al 1992). Khirbat Faynan is assumed to have been the principal focus of this activity in the Nabataean, Roman and Byzantine periods and the site is commonly identified with references to the copper mines of Phaino, to which Christians of Palestine and Egypt were transported in the third and fourth centuries A.D. Given the wealth of archaeological evidence, therefore, the Wadi Faynan seemed ideal for an inter-disciplinary investigation of a desert landscape and of the long-term exploitation of its plant, animal and mineral resources. The third reason for the study is that the remarkable archaeological landscapes of the Wadi Faynan are increasingly threatened by modern development: the lower part of the Wadi Faynan has been turned over to intensive vegetable production irrigated by water piped down from a major spring in the Wadi Ghuwayr and year by year the system is extending further up-wadi. Cemetery sites are also being pillaged by grave-robbers, the context for an on-going rescue excavation by a BIAAH team. ... In no sense can the wadi system be understood as a closed cultural system: the exploitation of mineral resources and trade in metal have of course inextricably linked the area with the outside world, whilst in terms of agriculture, for example, the Bedouin pastoralists who currently winter their flocks in the wadi take them up to their villages on the plateau edge in the summer, whilst the market gardening now expanding in the lower wadi is a cash economy developed to meet the expanding urban market of Amman. The BIAAH conducted a reconnaissance survey in the Wadi Faynan in the spring of 1995 (Barnes et al 1995 in an unpublished report): three transects of terrain across the main wadi below its confluence were investigated by intensive 'field-walking'. This fieldwork demonstrated the likelihood of considerable time depth in the settlement record: the team located numerous lithic scatters likely to be of palaeolithic, epipalaeolithic and neolithic date, a number of concentrations of pottery and lithic material of chalcolithic and early bronze age date, possibly associated with burial cairns, and a variety of Nabataean, Roman and Byzantine structures. Furthermore they also noted that the field system in the transects was carpeted with Nabataean, Roman and Byzantine pottery, prima facie evidence for a period of use of similar antiquity ... The team worked in the Wadi Faynan in April and May 1996 alongside a team directed by Karen Wright conducting an initial investigation of a settlement site of early bronze age date located by the 1995 BIAAH survey within the field system (now designated as site WF100 in the survey record), though this work is not reported on in detail here. The study area is immediately to the east of one of the fundamental discontinuities of the Earth's crust, the Wadi Araba and Dead Sea Transform Fault System. The latter forms part of the boundary between the African and Arabian tectonic plates which since the Miocene has accumulated approximately 105 kilometres of left-lateral movement (Quennell 1984). An early (PrePottery B) neolithic settlement being excavated by Mohammad Najjar of the Jordanian Department of Antiquities, dated to the later eighth and seventh millennia B.C., is located in the Wadi Ghuwayr (site 'Wadi Ghuwayr 1'). More generally, within the immediate study area, neither flint artefacts likely to be later than palaeolithic in date, nor traces of field systems, have been found resting on surfaces developed on the Ghuwayr Beds. The environmental conditions at the time of the neolithic and chalcolithic settlements at Wadi Faynan were substantially different from those which prevail today: there was relative stability, quiet and perennial water, and notable biological production, in stark contrast with the mixture of drought and flooding in the wadi today. Much of the ancient field system was constructed on surfaces developed on the Lower and Upper Faynan Beds and at a number of locations in the study area the upper parts of the Upper Faynan Beds appear to contain postpalaeolithic artefacts and structures. 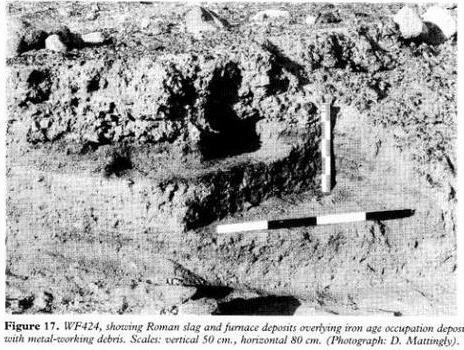 The 250-hectare area of fields to the west of Khirbat Faynan, running for some eight kilometres along the southern side of the Wadi Faynan and termed site WF4 in the BIAAH 1995 survey, was a prime focus of the archaeological fieldwork. The dating of the walls at the beginning of our fieldwork was entirely uncertain, apart from the observation from the trial field-walking by the BIAAH team in March 1995 that the surface pottery was predominantly Nabataean, Roman and Byzantine. Although the Nabataean, Roman and Byzantine settlement hierarchy was in all probability dominated by the huge centre of Khirbat Faynan, it is abundantly clear as a result of the initial work of the Wadi Faynan Project that many smaller sites and structures of these and other periods exist in and around the field system. In panicular, there is an almost continuous zone of cemeteries of all periods along the southern fringes of the fields, and in places within them too. Some sites are visible as physical structures such as small enclosures, stone settings for graves and deliberately constructed gaps or stepped features in the wall system thar can be confidently recognized, respectively, as sluices and spillways. In this initial phase of our work we concentrated on the area of the field system, within which the archaeological features include a wide variety of domestic and funerary sites of different periods, but it is also clear from a few days' reconnaissance survey on the adjacent hill slopes that the entire study area bears the traces of a very long antiquity of complex domestic and ritual landscapes that remain to be mapped and analyzed. The first point to make about the ancient farming of the area -- as represented by the field system -- is that it does not appear to have been dependent on irrigation using perennial stream sources, whether delivered by aqueduct or other means, along the lines of the modern irrigation systems. However, neither do the wall systems of the terrace area appear to represent, as we had tended to assume at the outset of the fieldwork following our work on the ancient floodwater farming systems of Tripolitania (Barker et al 1996), a systematic attempt to develop an effective means of trapping and delivering rainwater to farmed areas on the terrace surface. Whilst it certainly is the case that such floodwater farming did occur in the area, as in the Negev Desert, this intention does not appear to have dominated the ideas of the builders of the walls in this area. The present landscape of the Wadi Faynan is the result of complex interactions between natural and human processes including climatic fluctuations, tectonic activity, agriculture and mining. 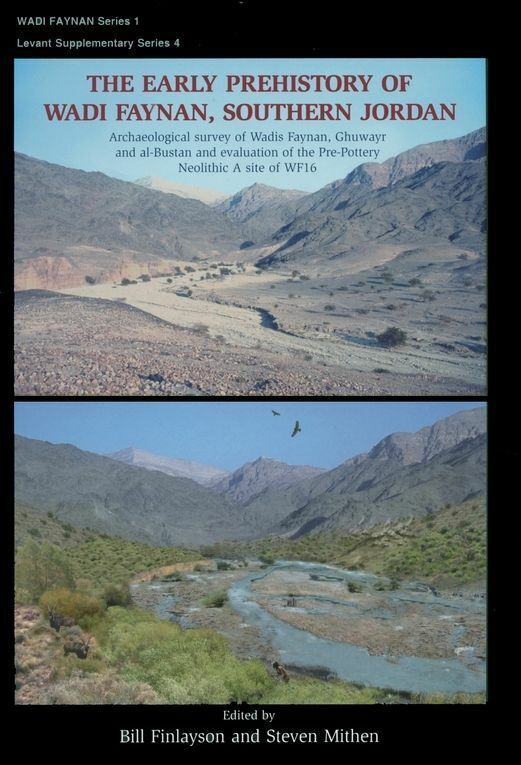 Our preliminary study of the nature and distribution of the Quaternary deposits present in the Wadi Faynan and its tributaries has revealed a complex history of events from circa 150,000 years ago to the present embracing environmental changes of great magnitude; and our study of the archaeology of the field system along with the investigations of other archaeological teams, indicates the potential of the study area to yield an equally complex history of settlement and land use. The evidence for human occupation at this time recovered by the team consists of sporadic chipped stone artefacts, mostly of middle palaeolithic type. However a reconnaissance survey in April 1996 by Bill Finlayson and Steve Mithen immediately prior to our own campaign discovered an epipalaeolithic (final palaeolithic) site (WF16) consisting of flints, quernstones and other groundstone artefacts. The Epipalaeolithic in the Near East is of course of critical interest as a key transitional stage to the emergence of agricultural communities, being characterized by social elaboration, the specialized exploitation of plant foods and herd animals, and a degree of sedentism especially at lower elevations, with upland sites usually intrepreted as task-specific sites related to residential sites in the lowlands. A full-fledged agricultural community was established here early in the Holocene, probably by the eighth millennium B.C. 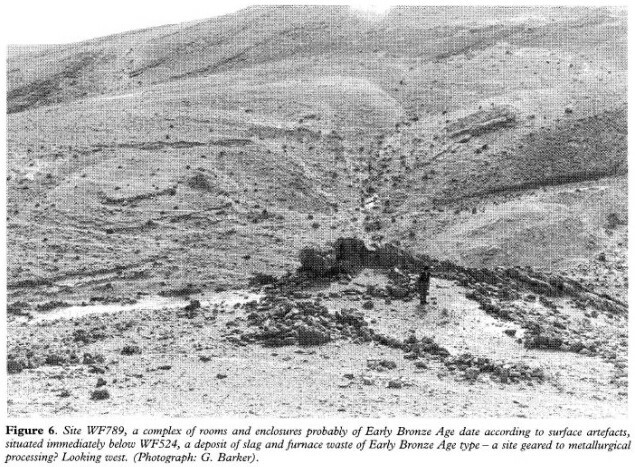 Wadi Ghuwayr 1, the PPN site being excavated by the Jordanian Department of Antiquities, is of a date range similar to the well known village of Beidha a few hours walk away on the plateau near Petra (Kirkbride 1966) and has a similar range of structures and artefacts ... The spring-side location is typical of many early farming settlements in the Near East, suggesting a reliance on naturally-irrigated land for crop farming and animal grazing (Bar-Yosef 1995). The discovery within the Upper Faynan Beds of the presence of a more-or-less perennial stream adjacent to Tell Wadi Faynan and associated with the site's occupation in the sixth and fifth millennia B.C., presents a strikingly different picture from today of a relatively rich and diverse aquatic landscape. Interestingly the pottery and mortar from the site contained a mixture of reeds and grass as well as straw (Najjar et al l990r 41). The excavations at Tell Wadi Faynan found traces of simple rectangular dry-stone buildings associated with storage pits, sickle blades, carbonized cereals and a faunal sample dominated by the bones of sheep or goat. We found traces of what may be a boulder wall in the river section fifty metres or so east of the settlement, so an important question to try to resolve in future years will be whether this community was growing its crops on moist backswamp soils, as Sherratt (1980) for example has argued for neolithic settlements in basin-edge locations such as Catal Huyuk in Turkey and Nea Nikomedeia in Greece, or whether people in the Wadi Faynan were now beginning to experiment with systems of floodwater farming using primitive diversion walls. By the later fifth millennium B.C. the Tell Wadi Faynan community was extracting malachite copper ore on a small scale from the local sandstones, and smelting it on site, creating quantities of iron-silicate slag (Najjar et al 1990). This development accords with the evidence from the region as a whole, that the systematic exploitation of copper ores began in the Chalcolithic and then greatly expanded in the third millennium B.C. during the Early Bronze Age, accompanied by technological improvements allowing the large-scale use of low grade ores (Adams 1991; Adams and Genz 1995; Hauptmann 1989 and 1992; Hauptmann et al 1992; Rothenberg 1972). The social and economic context of these transformations, for example the nature of the control of the ores and of the trade in their products, and of the impact of the expansion of copper mining on local economic and social organization, are much debated (Finkelstein 1995; Joffe 1993) and form the principal research focus for Dr Wright's investigation of site WF100. Although direct information regarding chalcolithic and early bronze age cultivation systems in the region is still extremely poor there are some archaeological indications from the Negev that the settlement transformations at this time were associated with the development of simple floodwater farming systems (Cohen and Dever 1980, 42; Levy 1995, 230), and the thesis is supported now by phyolith evidence in cereal crops (Rosen 1992). It is noteworthy that the scale of mining activity in the Wadi Faynan through the Nabataean, Roman and Byzantine periods also seems to have been highly variable through time: charcoal analysis from the major smelting site of Khirbat an-Nahas indicated that in the earlier centuries of the first millennium B.C. the activity was relatively small scale with little impact on the environment --- people were able to gather sufficient fuel wood for the smelting within walking distance of the site without significant damage to the local ecology (Engel 1993). The Roman period however, was characterized by a massive expansion in exploitation (Hauptmann 1992). Abstract: This report describes the second season of fieldwork to construct a model of landscape development for the past 10,000 years in the Wadi Faynan in southern Jordan. Over half of the complex field system WF4 has been recorded in terms of wall construction, surface artefacts, and hydrological features. A complex sequence of settlement and land use is emerging from these studies, especially regarding systems of floodwater farming over the past three thousand years. Field observations of wadi downcutting and preliminary pollen analysis both suggest that one factor in this development has been considerable environmental change over the same period. Background: The preliminary fieldwork by the team in 1996 was reported in Levant XXIX (Barker et al 1997). This report describes the initial findings of the second campaign of fieldwork (Aprll 4th-24th 1997). The fieldwork concentrated on the part of the field system immediately west of Khirbat Faynan, the ancient site dominating the confluence of the three wadis that form the Faynan; the Wadis Dana, Ghuwayr and Shayqar. Khirbat Faynan is assumed to have been the principal settlement in the Wadi Faynan in the Nabataean, Roman and Byzantine periods and is commonly identified with references to the Phaino to which Christians from Palestine and Egypt were transported in the third and fourth centuries A.D. to work in the copper mines which it controlled. The predominant finds from the field-walking were Roman/Byzantine sherds although lithics, glass, slag and copper ore were also recovered. Brief preliminary reports are presented below on the lithics and pottery. More than 3,500 pieces have been collected by the team to date, 3,078 of which were analyzed in the 1997 field season ... In terms of chronology there is a 'background noise' of stray middle palaeolithic artefacts occurring singly within collections of other material. This middle palaeolithic element, falling within the date range 210,000-35,000 years ago, comprises chunky, flake-based scrapers and denticulates. Regarding the Upper Palaeolithic, well-made punch-struck blades are lacking in the collections but there is a consistent appearance of relatively large blades with broad, plain striking platforms on medium-grained chert, which could be upper palaeolithic in date though they could also fit into later industries. Blades and a blade core of probable upper palaeolithic date have been recovered by geomorphological survey from a section in the Wadi Ghuwayr (site 5029). Similarly an epipalaeolithic blade and bladelet presence is probable but consistent patterning within a single assemblage is lacking. The collection of sickle blades with gloss shows cereal harvesting activities which would again span a broad time range (from the Epipalaeolithic virtually until the present) but the various wear and damage characteristics of the pieces suggest they are unlikely to derive from recent threshing trolleys; a mid-Holocene date is likely. There is no evidence for the blades being reversed in their hafts and reused. Reconnaissance survey outside the field system indicates that lithic material is denser on the low hills overlooking the fields than within the field system itself and richer in materials ... The concentration of material around the late neolithic/chalcolithic settlement of Tell Wadi Faynan (Najjar et al 1990) is particularly striking as is the spread of material on either side of the tributary wadi that forms the southern boundary of units 4.3, 4.6, 4.7, 4.9, and 4.10. Another feature of the distribution is the evidence for site or off-site activity roughly contemporaneous with the occupation of the major early bronze age settlement WF100 (Unit 4.13) ... The preliminary study of the lithics collected within the field system thus indicates that this part of the Wadi Faynan was the focus of a variety of activities certainly from the Epipalaeolithic through to the later prehistoric periods (a middle palaeolithic presence is documented but no in situ materials have been collected yet) and that, probably from the neolithic period onwards, both site and off-site activities extended over most of the area. In 1997 the material from units 4.1-4.6 was processed -- a larger finds team is anticipated for 1998. The pre-Nabataean pottery was examined for diagnostic pieces which would give an indication of a presence/absence of specific periods in the field systems ... The vast majority of all pottery in Units 4.1-4.6 is of Nabataean and later periods. In fact the material seems to indicate a long period of use of this area, which includes all of the major post-Nabataean periods up to the Ayyubid and Mamluk periods ... By far the largest component in the later pottery was of the Byzantine period, which made up the bulk of the later assemblage. The pre-Nabataean pottery was thinly distributed throughout the collections studied from Units 4.1 4.6 collections ... In total some few hundred sherds of pre-Nabataean pottery were found in the collected samples, with the vast majority of this material being non-diagnostic body sherds ... In the absence of diagnostic aspects of the sherds it was often impossible to ascertain with any certainty the date ranges of much of this material. Of the diagnostic pottery of this group which was separated out, the vast majority falls into two periods chronologically: the Early Bronze Age; and the later Iron Age (probably the seventh-sixth centuries B.C.). The early bronze age material contained some of the heavily grit-tempered forms which are already well known from Site WF100 and also from Wadi Fidan 4, a settlement some 10 kilometres to the northwest. This material is most likely to be EB I in date though this cannot be certain until further evidence is available. Alongside this pottery however was some later early bronze age pottery, most likely from EB III-IV, indicating continued use of the area throughout the Early Bronze Age. Comparative examples of pottery are known from the excavations at Khirbat Hamra Ifdan in the Wadi Fidan. Perhaps the most surprising corpus of material from Units 4.1-4.6 is the large amount of probably late iron age pottery ... The iron age material collected from Units 4.1-4.6 concentrated in general in the upper fields at the eastern end of the system. One possibility is that the material represents a background scatter relating to (presumed) iron age settlement at Khirbat Faynan but given its location in the higher terrace fields it is possible that it is indicative of remnant iron age field systems in this part of the wadi. A combination of both scenarios is probable. In either event the presence of iron age pottery here is further confirmation of the extensive iron age occupation of the region already known from smelting sites such as Khirbat al-Nahas, which most likely relate to the establishment of the kingdom of Edom in the later Iron Age. During the 1996 fieldwork a core (5017) was taken from the sediments built up against the prominent barrage that has been constructed at the northern foot of the hill on which stands Khirbat Faynan, the 'reservoir infilling' marked in Figure 1. The barrage would have prevented any water flowing down the narrow valley on the northern side of Khirbat Faynan from egressing into the Wadi Dana and is probably associated with the smelting activities of the site: like the huge piles of smelting debris, the reservoir and aqueduct opposite the site on the southern side of the Wadi Shayqar dated fairly securely to the Roman period. Whilst there is evidence for prehistoric settlement at Khirbat Faynan, the similarities in construction of the barrage with the walls of the main field systems, and its context within the suite of structures around the site associated with smelting and water control, suggest that it is probably Nabataean, Roman or Byzantine in date. Initial radiocarbon dates confirm this, indicating a date for the basal deposits of circa 2500 B.P. A considerable environmental change has occurred in the study area during the past 2500 years. The vegetation shortly after the commencement of the filling of the reservoir was to an extent degraded but seems to have been relatively stable for a considerable period ... There is some evidence for aridification in the higher counts of the drought indicator Ephedra around 1.3-1.8 metres (in Figure 14) ... This is accompanied by the virtual ending of cereal cultivation above 1.6 metres and suggests the end of widespread arable farming near the Khirbat. This portends the collapse of the steppic component of the local vegetation. This may have been a consequence of climate change and considerable aridification, but it might also be the consequence of a shift to pastoral agriculture as the key subsistence mode, centuries of overgrazing and the cumulative loss of soil and vegetation from the slopes around the site. The lithic artefacts collected within the field system indicate that the locality was visited by prehistoric people certainly from the epipalaeolithic period 10,000 years ago through to the later prehistoric periods. Preliminary survey by Dr Mithen's team in 1996 indicates that the foci of settlement for epipalaeolithic groups at the threshold of agriculture were the springs in the upper sections of the Wadis Ghuwayr and Dana. By the eighth millennium B.C. the Wadi Ghuwayr spring was the base for a fully fledged agricultural community ('Wadi Ghuwayr 1' Simmons and Najjar 1996); the location is typical of many early farming sites in the Near East -- presumably because the spring provided naturally-irrigated land for cereal fields and animal pasture (Bar-Yosef 1995). By the sixth and fifth millennia B.C. however, there was a later neolithic and chalcolithic settlement about a kilometre west of the Dana-Ghuwayr confluence at Tell Wadi Faynan (Najjar et al 1990). This settlement was situated within what we have defined as the Faynan Beds and this settlement was located in a relatively rich and diverse aquatic landscape that was very different from the modern desertic landscape -- there was a more or less perennial stream by the site and the likelihood is that farmers were able to grow their crops beside it much like the first farmers had been doing at the Wadi Ghuwayr spring ... The concentrations of material around Tell Wadi Faynan and along the main tributary wadi to the south that runs parallel with the main wadi (Figure 13) suggest that neolithic and chalcolithic farmers practised off-site activities such as pastoralism and hunting around their settlements on the wadi floor as well as growing their crops by the watercourses. In the last report we suggested that a series of circular depressions on the edge of the WF4 field system might be primitive water catchment structures of chalcolithic/early bronze age date (Barker et al 1997, 35-36) ... This complex of circular catchments, cairns and terrace walls is associated with late prehistoric pottery and lithics. 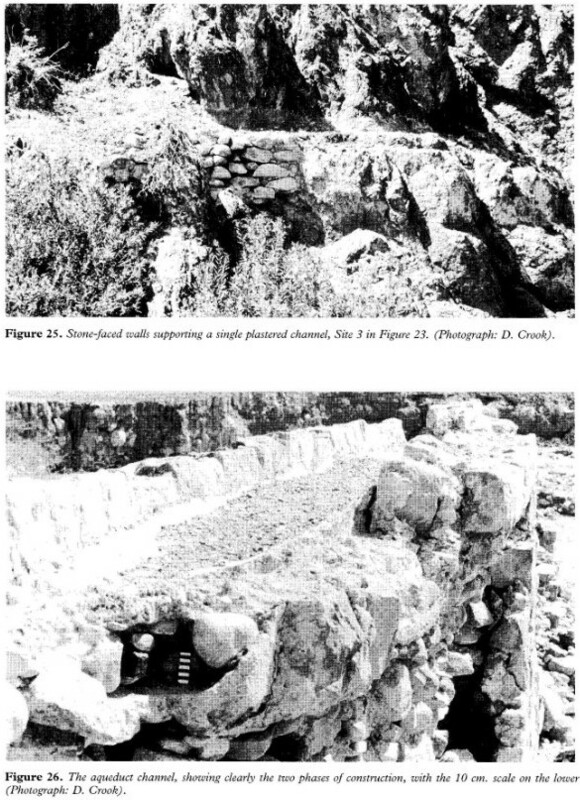 These structures bear resemblances to the microcatchment water-control systems and simple terrace walls found by Levy at Shiqmim in the Negev (Levy 1987). Whilst at this stage we can only offer a very tentative interpretation of the Wadi Faynan evidence, our hypothesis is that the social transformations of the chalcolithic period were associated not only with the systematic exploitation of copper ores but also with new systems of land use characterized by the deliberate management and storage of surface floodwaters ... The consensus is that significant aridity was developing by 5000-3500 B.C. ; chalcolithic floodwater farming was presumably developed in response to this, though in the context of the new social structures. The indications so far are that the first major phase of extensive floodwater farming concentrated on simple diversion barrages and terracing on the upper slopes and that it probably dates at least to the Nabataean period and may be earlier still. There are many similarities with the floodwater diversion systems recorded by Evenari et al (1971) in the Negev. As wadi down-cutting made these systems less effective, efforts concentrated increasingly on capturing the water at lower elevations and spreading it across the lower slopes by means of parallel-wall channels. Evidence for the latest phase of wall-building seems to have been forming from the Roman period onwards on the evidence of the association of the Roman aqueduct with a sand facies of this unit (Barker et al 1997, 27). The beginning of the major phase of wall building is probably more or less contemporary with the beginning of sedimentary accumulation behind the barrage at Khirbat Faynan circa 2500 B.P. The preliminary pollen analysis from these sediments indicates a relatively stable steppic landscape for a considerable period followed by a much more desertic landscape in which cereal cultivation was minimal. One important goal for our future fieldwork must be to investigate whether the eventual abandonment of the field system coincided with the significant landscape changes that can be inferred from the pollen diagram and if so, the extent to which this process of desertification was climatically and/or humanly induced. Abstract: This report describes the third season of fieldwork by an interdisciplinary team of archaeologists and geographers working to reconstruct the landscape history of the Wadi Faynan in southern Jordan over the past 200,000 years. The particular focus of the project is the long-term history of inter-relationships between landscape and people, as a contribution to the study of processes of desertification and environmental degradation. The geomorphological and palaeoecological studies have now established the outline sequence of landform changes and climatic fluctuations in the late Pleistocene and Holocene. The complex field system WF4 has now been recorded in its entirety in terms of wall construction, surface artefacts and hydrological features as well as most of the outlying field systems. From these studies, in combination with the analysis of the surface artefacts, an outline sequence of the water utilization and management strategies they represent can now be discerned ... Roman/Byzantine agriclture and mining severely impacted on the landscape in terms of deforestation; and geochemistry shows that Roman/Byzantine mining severely polluted the landscape, the effects of which are still apparent in the modern ecology of the study area. The project is a study of the 'archaeological history' of Wadi Faynan in southern Jordan by an inter-disciplinary team of archaeologists and geographers, our principal focus being the relations between people and landscape through time, especially in the context of understanding processes of desertification. Much has been written about desertification history by historians, geographers, ecologists, and archaeologists with the respective roles of climate and people being much debated. The archaeological evidence for apparently intensive phases of settlement in what are now dry and degraded environments is frequently brought into such debates with theories proposed that people played a significant role in the process of desertification through their actions, for example by developing irrigation systems that caused salinization, stripping the landscape for fuelwood, allowing their livestock to overgraze the vegetation and so on. However contempory ecological theory indicates that many dryland environments can in fact be remarkably resilient, recovering relatively quickly from over-intensive exploitation. Despite the frequency of speculation about the long-term role of people in desertification, there have been remarkably few modern scientific studies of the problem. Landscape archaeology, integrating the methodologies of archaeology and geography, has the potential to document the relationship between people and landscape over long timescales with the necessary precision to contribute significantly to the desertification debate. Today the main wadi presents a bleak landscape, arid and largely denuded of vegetation, though the tributary wadis are in places well watered and comparatively well vegetated from ground springs. The northern side is part of the Dana Reserve of Jordan's Royal Society for the Conservation of Nature and a few bedouin families are allowed to graze their goats there under controlled conditions. Other bedouin families graze the main wadi and in recent years its southern side was used for vegetable growing with water piped from the Ghuwayr spring, though this practice has now been abandoned. Before our project began the Wadi Faynan and its tributaries were known to be rich in archaeological evidence for past settlement. The principal ancient settlement in the wadi, long known to early travellers, is Khirbat Faynan (WF1 in the survey record), a major site of Nabatean, Roman and Byzantine date (at least) located at the head of the Wadi Faynan near the confluence of the Dana, Ghuwayr, and Shayqar tributaries. A preliminary survey by a team from BIAAH had located a broad suite of Nabatean, Roman and Byzantine sites down the main wadi to the west of Khirbat Faynan, mostly on the edge of a substantial field system of rubble walls (WF4 in the survey record), its surface pottery indicating a broadly similar date. 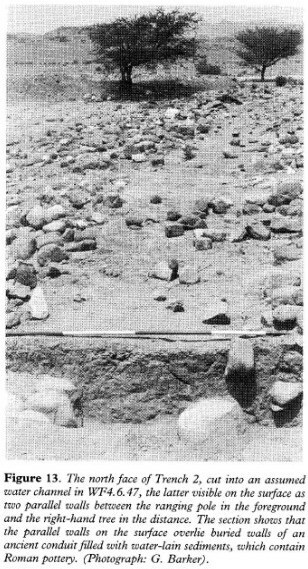 Excavations had begun on an early (pre-pottery neolithic) farming settlement in the Wadi Ghuwayr, (Wadi Ghuwayr 1: Simmons and al-Najjar 1996) and a later neolithic settlement in the main wadi had been excavated some years previously (Tell Wadi Faynan: al-Najjar et al 1990). The BIAAH survey also located a number of other prehistoric sites within and around the field system including a substantial early bronze age settlement (WF100). 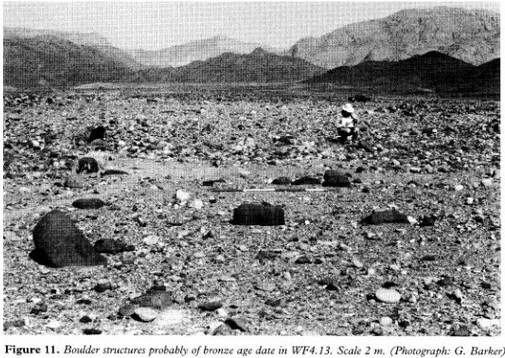 Given the scale of the WF4 field system and the diversity of settlement evidence in and around it the Wadi Faynan seemed ideal for a detailed investigation of the development of arid-zone farming techniques in the Near East. 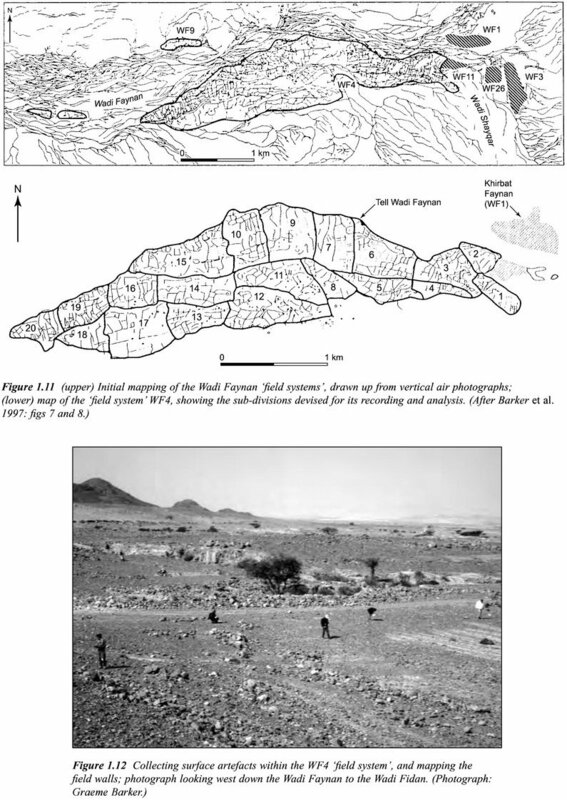 Wadi Faynan and its environs are also characterized by rich mineral deposits and from the work especially of the Bochum Mining Museum the history of copper exploitation here is well documented (Hauptmann and Weisgerber 1987; Hauptmann et al 1985, 1992). Although Faynan copper was used by neolithic and chalcolithic societies the first intensive exploitation seems to date to the Early Bronze Age (circa 3500-1900 BC). There was a second significant episode in the first part of the first millennium BC, the Edomite Iron Age. Copper was then extracted on a major scale in Nabatean, Roman and Byzantine times with Khirbat Faynan identified as the Phaino to which Christians from Palestine and Egypt were transported in the third and early fourth centuries AD to work the copper mines under its control. The character and extent of copper extraction in Islamic times are not clear but in recent years Jordan's Natural Resources Authority has been prospecting the ancient workings to assess the feasibility of renewing extraction. The Wadi Faynan is therefore a particularly attractive location for investigating the nature and scale of human impacts on a desertic landscape, given the millennia of industrial and agricultural activities that have characterized human settlement here. The archaeological survey of the eastern half of the WF4 field system and initial studies of the artefacts collected from it allowed us to propose preliminary models for the character of initial spring-based farming and for the development and character of floodwater farming in later prehistory and iron age/Nabatean/Roman/Byzantine times. Of particular note is the accumulating evidence for a significantly wetter environment in the early Holocene. Previously (Barker et al 1997) we reported the evidence of the sediments contemporary with and below the neolithic settlement at Tell Wadi Faynan indicating an environment of perennial streams by the settlement circa 6500 years ago 8-9 metres above the present wadi floor. We have also identified deposits in the Wadi Dana 10 metres above the present floor containing flint artefacts of broadly neolithic type, watersnails and organic residues, with a radiocarbon date of (uncalibrated) 7240 +/- 90 BP (Beta 11121). It seems likely that this wet phase ended circa 6000 years ago as the river began to cut down towards its present floor. We also have important pollen evidence from sediments at three locations sampled in the 1998 season for the nature of chalcolithic and bronze age environments in the Wadi Faynan. WF48: Site WF48 is an oval catchment structure at the south-west corner of WF4.13 similar in construction to the fragmentary boulder walls in this part of the field system which we believe are likely to be of early bronze age date (see DJM below: the bronze age landscape in WF4.13) ... The presence of the peridinioid dinoflagellate cyst Saeptodinium is consistent with the structure having contained relatively deep and permanent standing water. Site 100: Three samples were taken from in situ early bronze age deposits in the wall of one of Dr Wright's trenches (Operation 3: Wright et al 1998) with her assistance. Discussion: Though the dating of the WF24 and WF148 catchments remains insecure, there is a consistency between the preliminary results from their sediments and from the more securely-dated sediments in WF100 Operation 3 suggesting that the significantly wetter environments of the early Holocene were probably succeeded by a relatively diverse steppic landscape by the fourth and third millennia BC (the Early Bronze Age) with some degradation perhaps developing through time. The use of structures such as WF24 and WF148 to store water for considerable periods is confirmed by the finding of algal microfossils consistent with relatively permanent water. It seems clear that whereas neolithic people farming the Wadi Faynan had access to perennial water, later prehistoric farmers had to develop strategies for coping with more arid environments. Furthermore the large spoil heap beside the WF24 cistern and the finding of very large numbers of recycled soil fungi in the WF24 sediments are consistent with very strong soil erosion during and after the use of this stnrcture. Such erosion could result from poor land management techniques by the agricultural population, or of aridification removing the steppic vegetation cover, or a combination of factors. However given the notorious resilience of steppic vegetation, our present inclination is to place more emphasis on climatic change as likely to be the more significant factor, suggestive of a major environmental deterioration through the last two millennia BC. The steppic landscape indicated for the Bronze Age contrasts strongly with the very degraded steppeland present by Nabatean times in the later first millennium BC and the even more degraded desertic environments present later, as evidenced by the sediments cored behind the Khirbat Faynan barrage (Hunt and Mohammed 1998) ... From the results of this work should then emerge a robust and refined model of the pattern -- causes and chronology of Holocene sedimentation and vegetational change, including an evaluation of the respective roles of climate and people in shaping the Faynan landscape over the past 10,000 years. The spoil and slag tips from past mining and smelting activities, especially those of the 'climax phase' of the Nabatean -- Roman and Byzantine periods, still occupy large areas of the Wadi Faynan and its region and represent potentially highly dynamic and polluted systems. Heavy metals such as copper and lead, in particulate form or in solution/suspension, can be mobilized by processes including sheet and gully erosion, atmospheric erosion (Pyatt and Birch 1994) and leaching, and can thus continue to contaminate the atmosphere -- pedosphere and hydrosphere. The application of Energy Dispersive X-ray Micro-Analysis (EDMA) is allowing us to measure the changing scale of environmental pollution caused by past mining and smelting activities, and the legacy these activities have left in the landscape today. The Energy Dispersive X-ray Micro-Analysis (EDMA) described here sought to establish rapidly the proportions present of elements above Sodium in the Periodic Table. EDMA is ideal for preliminary studies of this nature in that the results obtained are broadly representative of the pollutant concentrations present and allow later studies to be carefully focussed ... The data suggest the extent to which the heavy metal load of archaeological sediments in the Faynan may reflect general levels of soil and rock erosion and transportation, as opposed to the consequences of mining and smelting in the study area. 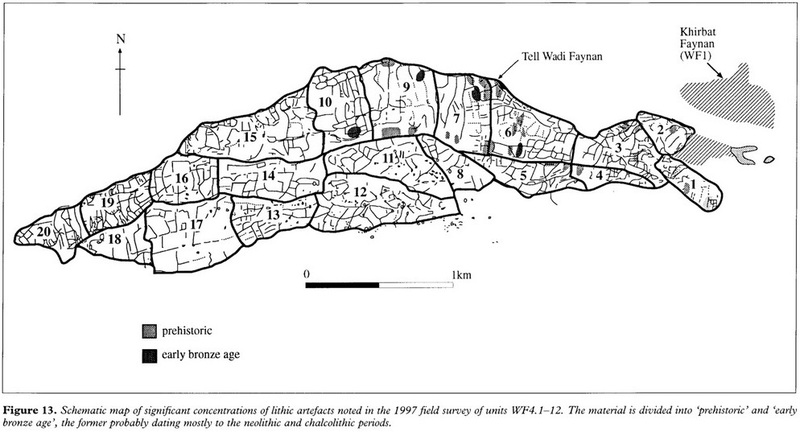 The first location studied is the section exposed at Tell Wadi Faynan: there is a continuous sequence of windblown sands and silts here, which accumulated several kilometres downwind of the key metal-smelting areas around Khirbat Faynan (Barker et al 1997, Figure 6). These sediments have yielded radiocarbon and archaeologically-dated materials which demonstrate that they were of late neolithic antiquity at their base and Roman/Byzantine age at their surface (al-Najjar et al 1990) ... The second location is the accumulation of slopewash and windblown materials in a reservoir behind a barrage at Khirbat Faynan. As discussed by Hunt and Mohammed (1998), this deposit probably represents a more or less continuous sequence of sediments spanning the past 2500 years, that is, from approximately Nabatean times to the present day. These data suggest that significant pollution began after the Late Neolithic and reached extremely high levels in the Roman-Byzantine period, a pattern which corresponds with both wider patterns of Cu emission to the atmosphere postulated for the northern hemisphere by Hong et al (1996) and the industrial history of the Faynan region proposed by Hauptman (Hauptman et al 1992). It seems clear from the proportions of copper detected in both the upper Tell Wadi Faynan sequence and in the basal Khirbat Faynan sequence that there were high levels of environmental pollution caused by copper processing in the Nabatean, Roman and Byzantine periods, concentrations which coincide, of course, with the plentiful archaeological evidence that these periods, the Roman and Byzantine in particular, witnessed intensive copper mining and smelting. It is clear that the mining and smelting residues of the Faynan landscape are having notable pollution impacts even today, and it is conceivable that the local bedouin may be the recipients of enhanced copper body burdens ... The comparison between the scales of metalliferous environmental pollution today and in the Nabatean/ Roman/Byzantine periods suggests the likelihood of severe effects on human health in those periods of antiquity as a consequence of inhalation, skin contamination, and bioaccumulation from animal and plant foods. Livestock would surely have been affected from grazing polluted vegetation, as the sheep and goats still are today. On the evidence of the modern barley transect, plant productivity would also have been impaired. The 1998 field season saw the continuation of artefact pickup and wall recording across the field system WF4, completing the programme begun in 1996. By the end of the 1997 season, 12 of the 20 units into which the field system had been divided had their fields recorded and samples of surface artefacts collected. Hence the priority of the 1998 season was to record and collect material from the outstanding units of the major field system --- WF4.13-18 (Figure 8). The 1998 studies, of both the WF4 field system and the field systems beyond, have considerably enhanced our understanding of the chronology and functioning of the ancient floodwater farming systems in the Wadi Faynan. Further investigation of the field systems and other structural evidence in area 13 of field system WF4 revealed important information about the landscape evolution in this area. The excavations carried out in 1997 (Wright et al 1998) provided the key to interpreting and separating out the early bronze age and later landscape features. This unit comprises a well-defined terrace containing 30 fields demarcated by walls of probable Nabatean and later date, while a dense spread of early bronze age pottery had indicated, even before the start of the current fieldwork, that a substantial settlement of the Early Bronze Age existed beneath ... The 1997 excavations had confirmed that the main series of held walls that we see today were of Nabatean and later date, but that numerous features of bronze age date were also surviving, in part incorporated, in part destroyed, in part buried below the later walls. A record was made of over 60 features in this unit. Many of these numbers were allocated to boulder lines breaking the surface and indicating the presence of underlying bronze age walls or structures (Figure 11). In the clearest examples, it was apparent that bronze age rectilinear buildings had been incorporated directly into later field walls. The surface evidence from unit WF4.13 suggests that there was a very substantial settlement of early bronze age date here. The material is mainly concentrated on the terrace on which sits the later field system, but large middens of early bronze age date have been identified extending beyond both the eastern and western limits of the unit. There are several areas of dense boulder walls surviving. To the north of WF4 we surveyed a complex arrangement of separate but probably linked systems based on harnessing the water flow of two minor tributary wadis. The small wadis occupy two small valleys that open up into wide flat areas beside the main wadi, one wadi cutting through to the western valley from the eastern one. The examination of the unusual field unit WF424 produced some highly significant archaeological data: we have discovered a major iron age site lying immediately north and north-west of Khirbat Faynan (WF1), with associated metallurgical workings and probable field systems. The morphology of the field unit was quite distinctive and rather different from most of the obvious hydrological systems examined in the other field systems. Just as with unit WF4.13, this is another case where close examination of the visible archaeology suggested two distinctive constructional phases. Once again, the earlier phase comprised numerous walls founded on lines of boulders, often set orthostatically. In this case the bulk of the surface material is iron age in date ... Density of the iron age material suggests that we have a substantial occupation site here along with its associated field systems, which was later overbuilt by an extended field system, encapsulating many elements of the earlier structures into its rather haphazard layout. The dating of this second phase is not certain at present, but may well be Nabatean to judge from the surface sherds. In addition to the two main constructional phases suggested by analysis of the wall systems, it is clear that the area has also witnessed a significant level of copper smelting and other industrial activity ... It is hard to reconcile this material with the interpretation of the final function of the wall system here as related to farming activity: the air-borne and terrestrial pollution of such large-scale industrial activity must have had a very considerable impact on the continued usage of this part of the field system for farming ... Furthermore, during our examination of these Roman metal-working areas we discovered, in a gully of recent formation cutting through some of the Roman slag and furnace deposits, a lower level of metal-working debris (Figure 17). This contained furnace debris of a fabric that is very distinctive in comparison with the slag-tempered Roman furnace walls. The association of iron age pottery would seem to indicate an iron age date for this metallurgy. 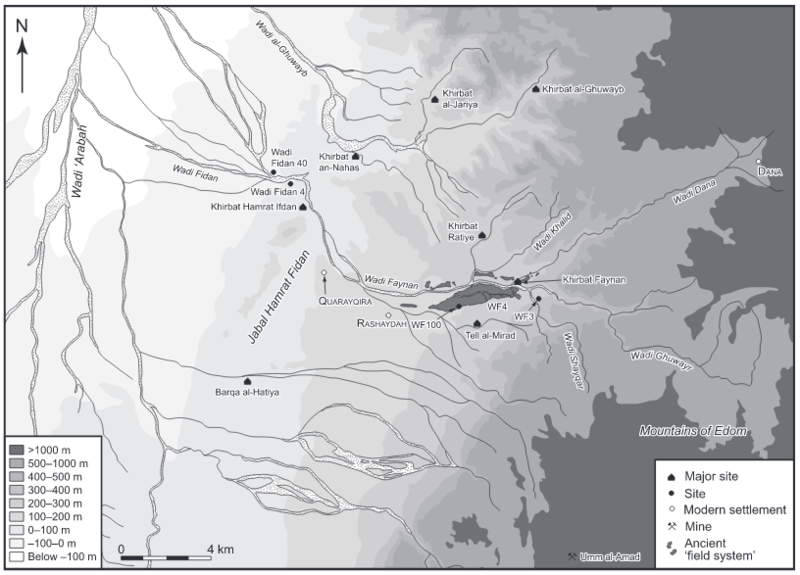 The 1998 fieldwork indicates that they can be divided into two principal types: those exploiting water from wadis through damming and diversion, and those re-directing overland flow. Initial indications are that channels associated with the direct tapping of wadis tend to be wider (circa 2-2.5 metres) and formed by parallel free-standing walls, whilst those capturing and redistributing overland flow are predominantly formed by a dwarf wall at the foot of a faced terrace. Field observation demonstrates clearly the tapping of the main Wadi Faynan (even though downcutting since Roman times has moved the floor of the wadi some five metres below the present level of the fields) to irrigate a narrow strip of fields along the northern fringes of the system. The infiltration [rate] measurements taken in the field were illuminating, indicating that infiltration levels are uniformly low: thus rainwater moves swiftly over the landscape with little loss, making water diversion and trapping systems feasible even in those areas of the WF4 field system where the gradient slope is very slight. The lack of evidence for salinity-related deposits also suggests that the main field system WF4 was fed by floodwater; the Ghuwayr spring only being used for the aqueduct/reservoir/mill system. The study supports the conclusions of the field-system analysis regarding the efficacy of the parallel-wall channels for moving water onto the extensive lower sections of the WF4 system. A detailed study was also made of the aqueduct/reservoir/mill system assumed to date to the Roman/Byzantine period (Gardiner and McQuitty 1987; McQuitty 1995; Figure 23). 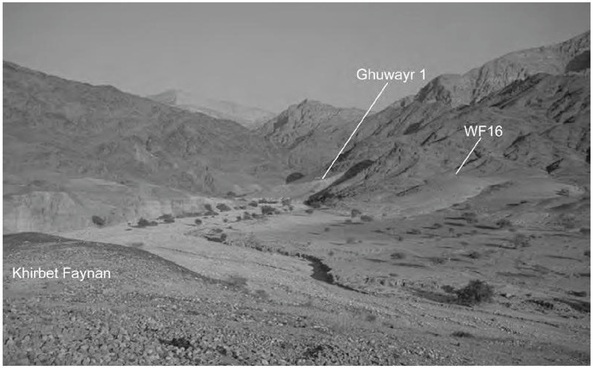 Sections described by Frank in 1934 were no longer observable but evidence for the conduit was found much higher up the Wadi Ghuwayr. Headworks would have been located close to the current gauging station where flows are perennial. A large stone-cut channel, now partially filled with a large rock, is the first definite evidence for the start of the conduit svstem and a few metres on there is further evidence for this channel and an additional conduit carved into the rock face (Figure 24), the lower of which appears to be older. The section of conduit leading to the aqueduct described by Frank (1934) is no longer visible. The aqueduct itself was an impressive structure built to span the Wadi Shayqar. It contained a series of arches, the last of which collapsed on the 5 April 1998. The one remaining archway prior to this date had a span of 3 metres and a height of 3 metres. The section of conduit still surviving is 31.8 metres in length. The aqueduct has two clear phases of development with a lower channel replaced by a higher channel (Figure 26). Both channels were rectangular and lined with opus signinum plaster. The higher channel lies on top of the cobble-filled lower channel which has slightly larger dimensions. 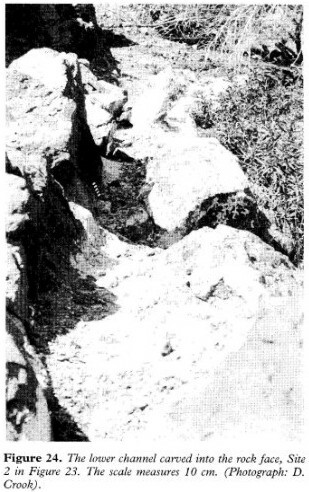 From the aqueduct there is little evidence for the course of the conduit but a line of stones and fragments of plaster suggest that the conduit flowed to the north of the line described by Frank (1934). An EDM survey shot from the Khirbat Faynan demonstrates the shallow drop in altitude (8.1 metres) between the aqueduct, reservoir and mill leat. During the 1998 survey season ethnoarchaeological fieldwork began in the Wadi Faynan and its hinterland, in particular the Wadi Dana and the adjacent plateau-edge communities, to investigate the nature of and relationships between pastoralism and agriculture. Both bedouin and villagers (fellaheen) manage herds and cultivate crops. The social and economic importance placed on each differs considerably however and there exists a diverse range and mix of activities along a continuum from bedouin who primarily herd flocks to villagers chiefly concerned with agriculture. Waged employment is increasingly vital for supporting and enhancing local livelihoods as in other parts of Jordan (Mundy and Smith 1990), and herding and farming are often supplementary to, rather than the basis of, household income. Not all groups, however, are at the same stage of economic development. Many people who were formally more mobile have settled in recent years. The geomorphological sequence of landform changes and climatic fluctuations established in previous years has been confirmed in its essential characteristics. The preliminary OSL and "C dates, in combination with archaeological artefacts associated with particular sedimentary facies, such as the handaxe from the Fass Yad terrace, have allowed us to construct a first approximation of the chronology of environmental change over the past circa 200,000 years. There are indications of parallel sequences of Pleistocene terrace formation in the principal feeder wadis of the Wadi Faynan and it seems likely that these may be correlated with the sequence already established of alluvial fan development. There is strong and widespread evidence for a significantly wetter environment in the early Holocene, probably lasting until circa 6000 years ago and although secure dating is still required, there is evidence that it was followed by a diverse steppic landscape by the Bronze Age. There has been significant soil erosion subsequently with our preliminary findings pointing to environmental degradation between the Early Bronze Age and classical times, probably reflecting aridification more than human activity. This bronze age landscape (if we are able to confirm the bronze age date) certainly contrasts strikingly with the degraded steppeland of Nabatean times and the even more degraded desertic environment that succeeded it when there is abundant evidence for human activity having a profound impact. The completion of the recording of the WF4 field system along its 4 km length on the southern side of the Wadi Faynan, the recording of major outlying units on the northern side and the study of the associated artefacts have confirmed and amplified our understanding of land use history. It seems clear from our own survey work in the Wadi Dana and other surveys and excavations in the Wadi Ghuwayr (Finlayson and Mithen 1998; Simmons and al-Najjar 1996) that the preferred locations for the settlements of the first neolithic farmers were by springs in the well-watered hills at the eastern end of the wadi. However the lithic material studied in 1997 and 1998 from the Wadi Faynan field systems also indicates small-scale neolithic activity throughout the main wadi, presumably hunting and pastoralism, and neolithic sites are also known in the Wadi Fidan. By the Late Neolithic the people living at Tell Wadi Faynan were probably exploiting the seasonal floodwaters of the main wadi for their crops without practising floodwater diversion systems. The nature of chalcolithic settlement and land use remains elusive but by the Early Bronze Age there was an extensive zone of settlement on the southern side of the main wadi both in the zone of WF4.13 (site WF100) and on the interfluves to the north. The boulder walls mapped in WF4.13, which we believe to be of bronze age date, seem to be vestiges of both structures and field boundaries and are associated with water storage structures. The series of terrace walls or check dams built across the shallow floor of a small tributary wadi flowing into the northern side of Wadi Faynan is also likely to be bronze age. Whilst dating remains problematic the indications are that bronze age farmers had developed simple techniques of floodwater farming. By the early first millennium BC, the Iron Age, we now know that the landscape was dominated by a substantial settlement (WF424), built like its successor Khirbat Faynan at the strategic centre of the Faynan region, the point where the three major tributary wadis (the Dana -- Ghuwayr and Shayqar) come together to form the Faynan. The settlement was associated with a field system of boulder-built walls often set orthostatically. Substantial boundary walls were built upstream of these fields which collected water from the surrounding slopes to direct maximum water flow down the central part of the field syste ... Whereas bronze age farmers built terrace walls at right angles across wadi beds to spread floodwater over surrounding fields and small catchments to collect water in cisterns, iron age farmers in Faynan had learned to construct substantial and rather sophisticated walls to divert the flow of floodwaters sometimes hundreds of metres from their natural line so that far greater quantities of water could be collected and sent down a field system than was possible with bronze age technology. As discussed in the 1997 report the technology of floodwater farming was further refined by Nabatean farmers, the focus of their wall-building activities moving especially to the small triburary wadis that run parallel to the main wadi along its southern side. Water was dammed as it issued from the adjacent hills, diverted westwards by boulder walls along the contour of the slope and then through simple sluices (gaps) and spillways (stepped structures) onto terraced fields below. Nabatean technology on the southern slopes may also have included channels formed by parallel walls that fed water directly into the fields on either side through sluice gaps. It seems increasingly likely from the studies of field layout and construction and of the surface material that the entire agricultural landscape was managed as a more or less integral system in the Roman and Byzantine periods ... The effectiveness of the system is in part explained by the uniformly low levels of infiltration we found at sample sites from the upper slopes to the lowest fields (See 'Palaeohydrology'). However organisational factors were also important. The field evidence supports the hypothesis of cooperation between areas of the field system fed by the parallel channels: rather than certain areas of the system having exclusive access to particular wadis at the expense of other areas the internal linkages between the system imply that water resources were shared. The construction of the major parallel channels to feed the main body of the field system demonstrates the same engineering skills in moving water relatively long distances over gentle gradients as the Roman aqueduct east of the WF4 field system and its rock-cut feeder channel from the Wadi Ghuwayr spring. Another very promising outcome of the proiect so far is the exciting geochemical evidence from sediments sampled near Tell Wadi Faynan and Khirbat Faynan that environmental pollution from copper smelting was small-scale in later prehistory, significantly greater in iron age and Nabatean times and enormous in Roman/Byzantine times ,,, It seems likely that the transition from the intensive farming and industrial processing of Roman and Byzantine times to systems of settlement and land use more akin to those of the present-day will turn out to reflect a complex interplay between climate change, humanly-induced environmental degradation and economic relations between Faynan and the wider world. Introduction: The Wadi Faynan Landscape Survey is a study of the landscape evolution of Wadi Fayran in southern Jordan over the past 10,000 years as a contribution to understanding processes of desertification and environmental degradation in arid lands ... Today much of Wadi Faynan forms part of the Dana Nature Reserve of the Royal Society for the Conservation of Nature (RSCN) and is used mainly by nomadic Bedouin herders. However the area is also known for its abundant archaeological remains that are prima facie evidence for episodes of intensive settlement and sedentary farming in the past, very different from settlement and land use today, from villages of early farmers 10,000 years ago to major settlements of the Nabatean -- Roman and Byzantine periods, the latter associated with relict field systems. Wadi Faynan is also rich in copper and lead ores and there is plentiful archaeological evidence that the former have been mined and smelted for at least 5000 years. The study area is therefore a particularly attractive location for investigating the history of interactions between a desertic landscape and its human inhabitants, given the millennia of industrial and agro-pastoral activities that have characterized human settlement here. The first farming by Neolithic people was practised in the early Holocene in a landscape significantly wetter and more vegetated than today. Simple systems of floodwater farming were probably first developed in the Early Bronze Age some 5500 years ago, coincident with the beginnings of aridification. These societies had also started to engage in systematic copper mining and smelting, trading the metal widely throughout the region. More sophisticated water-diversion techniques were used in the Iron Age, the period of the Edomite state in the early first millennium BC when the scale of industrial activity was also greatly intensified. There were further refinements to farming and smelting in the Nabatean period. However the most dramatic developments took place with the Roman annexation of the Nabatean kingdom in AD 106: mineral processing was organized on a massive (almost certainly state-controlled) scale and the entire agricultural landscape appears to have been managed as a single integrated system, presumably to feed the administrative personnel and, in particular, the large workforce engaged in mining and mineral processing. 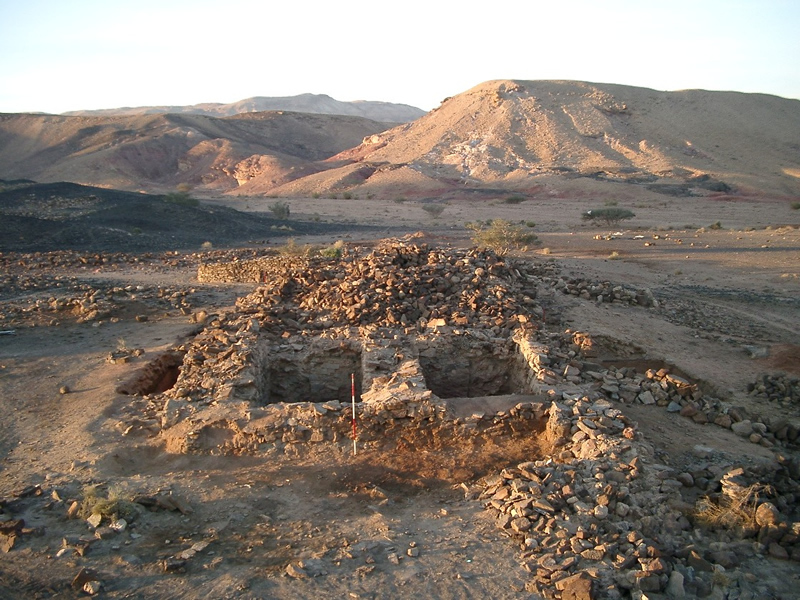 Initial results indicate that pollution began on a small scale in the Early Bronze Age coincident with the beginnings of metallurgy in the Wadi Faynan, increased significantly in the Iron Age and again in Nabatean times and then intensified dramatically in the Roman period. Industrial pollution declined to insignificant levels after the late Roman or Byzantine period, though there was another episode (small scale compared with Roman activity) later; the sediment layer with the evidence for this episode has not yet been dated but the smelting technology implied by the mix of pollutants suggests that it may relate to Mamluk metallurgy. Pollen and other palaeoecological studies indicate that the steppic landscape that had developed by the fifth and fourth millennia BC degraded further in the third and second millennia but it is not clear to what extent this process reflects climatic change (increasing aridity) or the activities of Bronze Age farmers, or both. However the pollen record shows that vegetation was then massively degraded in Roman and Byzantine times, almost certainly reflecting human activity --- presumably stripping the land of fuel-wood for smelting, farming the field system intensively and pastoralism. Fieldwork in previous seasons has demonstrated field system WF4 to be a complex palimpsest of occupation with many sites characterized by high levels of reuse and adaptation. Consequently it was envisaged that an extensive programme of archaeological survey beyond field system WF4, where sites tend to remain less disturbed, would further our understanding of site morphology and chronology in the Wadi Faynan as a whole. The nature of the 'sites' varied considerably and included: domestic structures and enclosures; field walls; cemeteries and individual funerary monuments; lithic scatters and pottery scatters not associated with structures; mining and smelting-related features; pictographs and inscriptions; Bedouin encampments and associated features; and stone settings and indistinct features of indubitably human origin but uncertain interpretation ... The overall impression from the initial studies of structure typologies and artefacts is that the landscapes around the Wadi Faynan have been affected by a palimpsest of human activity just as complex as that of the ancient field systems. Along the northern edge of the grid, where the wadis flowing towards the Fidan open out into a plain, most of the settlement seems to be located close to the foot of the hills. However a small number of ancient encampments and associated field systems was situated on low terraces directly adjacent to the wadi channels. On the southern side of the hills, the level terraces alongside the northern side of the Wadi Faynan have evidently been intensively exploited over time with much evidence of prehistoric (Bronze Age) activity and field systems (see Barker et al 1999, 275-77 for a description of these). In all sectors of this landscape there is considerable evidence of prehistoric activity which in advance of full analysis of the artefacts collected we believe to be primarily Early Bronze Age in date. A large number of circular or oval sites associated with prehistoric pottery and lithics was recorded. These sites typically consist of a main enclosure 10-15 metres in diameter with one or more rooms around the circumference, either attached to or integral with the construction of the enclosure. On the southern terraces these sites are sometimes associated with simple terrace and floodwater farming systems but in the other areas circular enclosures, sometimes with a few oval rooms attached, lack associated field systems. Did they have a more pastoral function than the structures associated with field systems ? 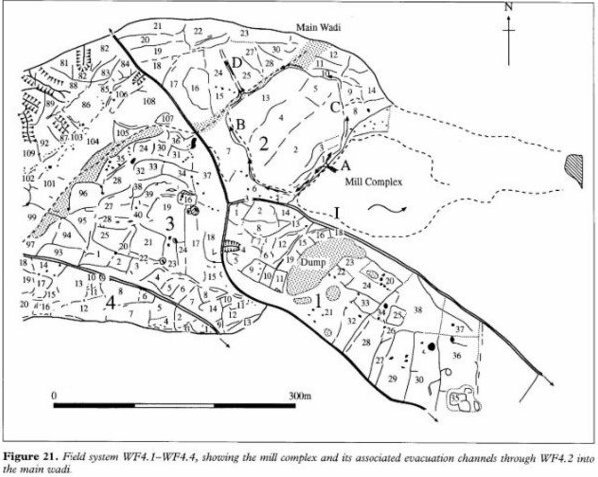 ... Several more complex settlements exist in a particularly notable concentration of sites centred on a Bronze Age slag and furnace waste deposit (WF524, UTM 36 R 0736000/3391800; Figure 6). If these three groups of sites are contemporary in use within the Early Bronze Age then we may be seeing three different archaeological complexes linked to three overlapping but diverse economic orientations: agricultural -- pastoral and metallurgical. Interestingly enough the evidence of Nabatean/Roman/Byzantine activity in this part of the landscape is much more restricted than elsewhere though there are on both the southern and northern fringes of the main field system structures of these periods associated with agricultural use but seemingly on quite a limited scale. Previous field seasons in the Wadi Faynan have established the broad sequence of Quaternary deposits, started the process of detailed palaeoenvironmental reconstruction, have monitored bioaccumulation of heavy metals through trophic levels and initiated the dating of the event sequence through ten preliminary OSL dates and five radiocarbon dates. A sequence of at least five major Quaternary fluvial aggradations has been recognized in the Wadi Dana and demonstrated to extend into the Wadi Faynan. Our mapping of the Quaternary stratigraphy started in the Wadi Ghuwayr in 1995 and has continued through the ensuing field seasons. Analysis of calcrete formation in the Quaternary deposits, based on more than 50 samples, has continued since 1995. Substantial palaeoenvironmental study of cored sediments has recognized, amongst other key findings, a wet early Holocene (circa 10,000-6000 BC) and thereafter a general drying to the present day. Detailed investigations of the history of metalliferous pollution from natural processes as well as mining and smelting in the region started in 1996. These have revealed localized areas of profound and potentially dangerous metalliferous pollution. Prehistoric pottery: The prehistoric material continued to fall into two primary categories: pottery presumed to date to Early Bronze Age I (EBA 1) and a limited amount dating to the later Iron Age (Iron II). The largest concentration of Early Bronze Age pottery came, as was expected, from WF4.13, where excavations have uncovered the remains of significant structures spread over a large area dating to this period and designated site WF100. Most of the ceramics collected in our 1996 survey of this unit were of a fabric and type associated previously with an EBA I date. Within the WF4 system there continues to be a consistent number of diagnostic sherds which at present is being attributed to the Iron Age. The range of Iron Age material in the Faynan area was discussed in the previous report but in general terms the Iron Age pottery from the western end of the field system is likely to be related to late Iron Age activities and not to be associated with the potentially-early Iron II pottery reported last year from site WF424, the area of structures, industrial activity and fields immediately below Khirbat Faynan. Perhaps the most intriguing aspect of the prehistoric pottery analysis in the 1999 season has come from examination of the WF sites outside the principal field system WF4. Although only about one-third of this pottery has been examined to date the percentages of early prehistoric pottery are substantial and suggest that, in addition to the concentrations of Early Bronze Age pottery in Unit WF4.13 and surrounding fields, the prehistoric landscape was very widespread and included outlying areas which have to a large degree remained free of the destruction caused in the main field system by Nabatean/Roman/Byzantine and later farming activities (see Between Faynan and Fidan). Classical pottery: Initial quantification has confirmed, as expected, that 'classical' pottery (that is almost exclusively Nabatean -- Roman and Byzantine) dominates in the south-east quadrant of the WF4 field system nearest Khirbat Faynan (WF1) and is virtually absent in the northwest quadrant. Most of the identifiable types belong to the later part of the classical sequence, indicating intensification of occupation during this period. The majority of classical pottery is thought to be regional in manufacture although a range of imported types can be identified in sparse numbers; mostly from the eastern Mediterranean. Of particular interest this year is the identification of growing numbers of both coarse wares and amphorae associated with production at Aqaba (Melkawi et al 1994) which provide important evidence of pottery being supplied to the region from Transjordan in the Byzantine and early Islamic periods. 1.1 Origin of the project: The Dana-Faynan-Ghuwayr Early Prehistory Project (DFGEP) was established in 1997 and involved four seasons of survey and excavation in its study region located in southern Jordan ... The project originated from a research initiative by the former British Institute at Amman for Archaeology and History (BIAAH). By 1996 BIAAH had been subsumed within the Council for British Research in the Levant (CBRL) and three new UK-based archaeological projects in Wadi Faynan had been established. Graeme Barker had convened an interdisciplinary team of archaeologists and geographers to examine landscape development within Wadi Faynan with a focus on the Roman/Byzantine field system (Barker et al 1997, 1998, 1999, 2000). A second initiative was led by Katherine Wright entitled the Wadi Faynan Fourth and Third Millennium Project. This was concerned with the excavation of a Bronze Age settlement (WF100) located during the BIAAH survey. This project sought to examine issues relating to Levantine–Egyptian links and the development of complex societies. Thirdly Dr Freeman of Liverpool University had begun a building survey of the Khirbet Faynan, the principal Roman/Byzantine standing monument of the area located at the juncture between Wadis Faynan, Dana and Ghuwayr (Figure 1.2). All of these projects were focused on the history of agriculture, mining and metallurgy, and the related development of the Christian community in Faynan. Finlayson was then approached to undertake work on the early prehistory of Wadi Faynan to complement the later prehistoric and historic studies being undertaken by Barker, Wright, Freeman and their colleagues. Finlayson invited Steven Mithen to collaborate on this project, recognising that research within this region could potentially address their mutual research interests concerning Levantine Palaeolithic, Epipalaeolithic and early Neolithic archaeology. A reconnaissance of Wadi Faynan for early prehistoric settlement was conducted in Spring 1996 (Finlayson and Mithen 1998), the results of which were sufficiently positive to justify the formation of the DFGEP with a four year programme of fieldwork. Archaeological work in the Wadi Faynan area has taken place for over a century. Initial visits by pioneering scholars such as Lagrange (1898, 1900), Musil (1907), Frank (1934), Glueck (1935) and Kind (1965) established the importance of the area particularly in relation to mining and early Christian history ... Surprisingly, given the extent of archaeological activity, very little was known about early prehistoric settlement in the Wadi Faynan region prior to the DFGEP project. The earliest dated settlement in the region was the Pre-Pottery Neolithic B (PPNB) site of Ghuwayr 1, at that time only partially excavated by Dr Mohammed Najjar (Simmons and Najjar 1996, 1998), followed by the Pottery Neolithic site of Tell Wadi Feinan (Najjar et al 1990). Up until April 1996 no major concentration of pre-PPNB material had been identified within the region covered by the DFGEP. The archaeology in the immediate vicinity of the confluence of the Wadis Dana, Ghuwayr and Shayqar is dominated by the Khirbet Faynan, a dense tumble of sandstone masonry within which there are substantial standing walls, which is associated with an aqueduct across the Wadi Shayqar, a reservoir, mill, cemetery, extensive deposits of slag and a field system that extends across the Wadi Faynan. Despite the absence of any evidence for pre-PPNB settlement, the study area appeared to provide considerable potential for addressing issues in Palaeolithic, Epipalaeolithic and early Neolithic archaeology of the Levant. Surveys elsewhere in Jordan and in similar landscapes to the study area had identified sites from all of these periods ... Consequently there was every expectation that a rich early prehistoric record remained to be discovered. The manner in which the project developed required that the Neolithic become our major focus of interest, owing to the discovery of a Pre-Pottery Neolithic A (PPNA) site, designated as WF16, during the reconnaissance survey of 1996 ... As a consequence the majority of the project’s limited resources were placed into evaluating this single site rather than into the field survey within the study area. That was nevertheless extensive and recovered a considerable sample of Lower and Middle Palaeolithic artefacts, but sparse evidence for Upper Palaeolithic and Epipalaeolithic settlement in the area. Palaeolithic sites are relatively rare in Jordan when compared to those of later periods or other regions of the Levant. The majority of Jordanian Palaeolithic sites are located on its plateau, in other highland areas in southern Jordan, or in the eastern deserts and oases. While relatively few stratified Lower and Middle Palaeolithic sites have been discovered, numerous surface artefact scatters are known. The scarcity of cave or rock shelter sites may account for the absence of hominin remains. Upper Palaeolithic sites are more numerous than those of earlier periods but have a similar distribution. It is now widely believed that the date of hominin dispersal from Africa may have been as early as 2 million years ago. The Jordan Valley is a continuation of the African Rift Valley and is likely to have provided one of two key dispersal routes from Africa, the other being across the Afar ‘gap’ into modern-day Saudi Arabia. The earliest dated site in the Jordan Valley is Ubediya at circa 1.5 million years ago but it is conceivable that considerably earlier artefact scatters and even hominin fossils may exist within the region. The Epipalaeolithic period in the Levant (circa 20,000 – 10,000 BP) is a period of considerable environmental change during which human communities had to continually adapt to changing distributions of animals and plants. The vast majority of archaeological sites are no more than scatters of chipped stone artefacts. These are complemented however by a number of sites during the final millennia of the late Pleistocene that have impressive architectural remains, human burials, art objects and a diverse material culture. Bar-Yosef’s (1970) original scheme for the cultural variability of Epipalaeolithic assemblages has been substantially elaborated resulting in several industries: the Kebaran, the Mushabian, the Geometric Kebaran, the Ramonian, the Natufian and the Harifian. The Natufian is often divided into an earlier and later phase. Many of the other industries are also further subdivided, principally on the basis of relative frequencies of microlith types. Epipalaeolithic sites are relatively common in Jordan compared to those of earlier periods with Olszewski (2001) suggesting a minimum number of “nine recognizable lithic industries and phases”. In 1997 no Epipalaeolithic sites were known in the DFGEP study area, the closest being those sampled in Wadi Hasa. The nearest Natufian site was that at Beidha, interpreted as a seasonal hunter-gatherer encampment. Where and when the shifts from entirely mobile hunter-gatherers to semi and then fully sedentary hunter-gatherers/cultivators/farmers occurred remains unclear and subject to considerable debate. Goring-Morris (1995, 166) separates the majority of the Epipalaeolithic from the Natufian, which seems to appear “quite abruptly and fully fledged” and is interpreted by some as representing sedentary hunter-gatherers. There appears to be a chronological correlation between the appearance of sites with substantial architecture, burials and a diverse material culture including artefacts for intensive plant processing and the late glacial interstadial (circa 14,700 – 12,800 calibrated BP). That climatic phase most likely created an abundance of plant and animal foods owing to increased rainfall. Bar-Yosef and Belfer Cohen (1989) argue that Early Natufian sedentism was the ‘point of no return’ with regard to the origin of farming. The identification of hunter-gatherer sedentism is however extremely difficult and some reject the notion that this is reflected in the Early Natufian settlements. One scenario for the final phase of the Levantine Epipalaeolithic is that the favourable environments of the late glacial stadial came to an abrupt end with the onset of the Younger Dryas (12,800–11,600 calibrated BP). This led to the complete or partial abandonment of the Early Natufian settlements and a return to a mobile hunter-gatherer lifestyle as reflected in the rather sparse record of the late Natufian prior to the emergence of farming communities at the start of the Holocene. One of our attractions to the DFGEP study area in 1996 was the on-going excavation of Ghuwayr 1, a PPNB settlement. This was the oldest known settlement in the area and it raised the general question regarding the origin of such PPNB settlements in southern Jordan: do they reflect the immigration of people from the north or a development by resident PPNA/Epipalaeolithic communities ? Ghuwayr 1 was just one of several impressive PPNB sites in southern Jordan, the others including Beidha, Basta and Ba’ja. In light of the extreme rarity and peripheral nature of PPNA and Natufian sites in this region, as it appeared in 1997, the notion of immigration into the area seemed most likely. Architectural transitions from round to rectangular dwellings are evident in the northern regions of the Levant, notably at Mureybet in Syria and this is where the earliest dates for PPNB settlements also occur. The issue of the origin of the PPNB in the southern Levant required examination by survey within the DFGEP study area to establish whether any PPNA settlement(s) had been in existence, and if so, whether any specific cultural links to Ghuwayr 1 could be identified. The presence of at least one PPNA site, designated as WF16, was identified by the 1996 reconnaissance survey. Other than this, the only other PPNA site in the vicinity of the study area known in 1996 was Bab edh-Dhra, 60 kilometres to the north of Wadi Faynan. A key research area regarding the PPNA that we hoped to address in the DFGEP concerned settlement patterns and economy within this period. While PPNA sites are rare within the Levant, those with sufficient animal and plant remains that enable questions about economic practices to be addressed are even more scarce. Opinion varies as to whether the PPNA is a period of hunting and gathering or farming with numerous variants within such categories, notably the cultivation of wild cereals. Related to this issue is the extent to which the PPNA settlements represent permanent ‘villages' or seasonally occupied campsites. While the monumental architecture at Jericho certainly suggests the former, that site remains unique. 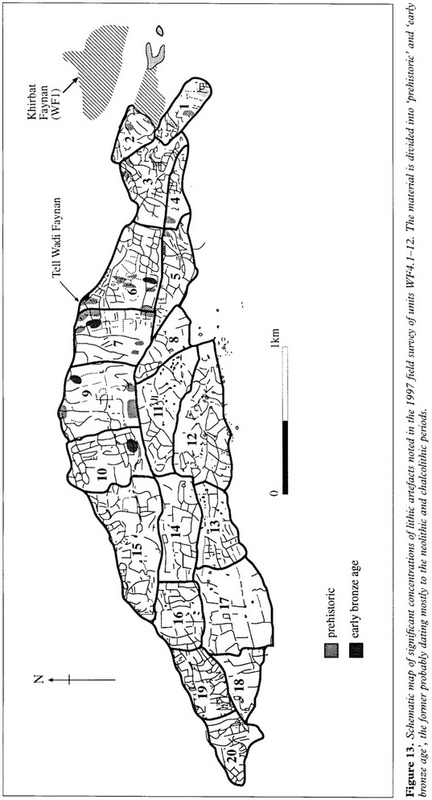 Kuijt (1994) proposed that PPNA settlement in the southern Levant formed a hierarchical pattern of settlement and his ideas seemed ready for re-evaluation. – The origin of the PPNA with regard to its continuity with Epipalaeolithic cultural entities, notably the Natufian and environmental change during the Late Pleistocene. – The cultural variation within the PPNA with particular attention to whether the Sultanian and Khiamian are distinct entities, and if so, whether they represent successive cultural phases or functional variants within the PPNA. – The economic basis of the PPNA with the study region: was this hunting-gathering, plant cultivation, herding or fully-fledged farming? Following the discovery of WF16 in 1996 and a test excavation in 1997, the two most substantial field seasons were undertaken in 1998 and 1999 with additional fieldwork at the site in 2000 and 2001 (See Bib # 1-4 Below). 3.6 Summary and conclusions: The survey programme was designed to locate preHolocene and early Holocene sites. The results produced two main groups of material: Chalcolithic/Early Bronze Age and Palaeolithic. Given that one main focus of the research was the earliest Neolithic it was unfortunate that remarkably little Epipalaeolithic or early Neolithic material could be found. At face value the surveys suggest that any Epipalaeolithic occupation of the area was very slight, if it existed at all. 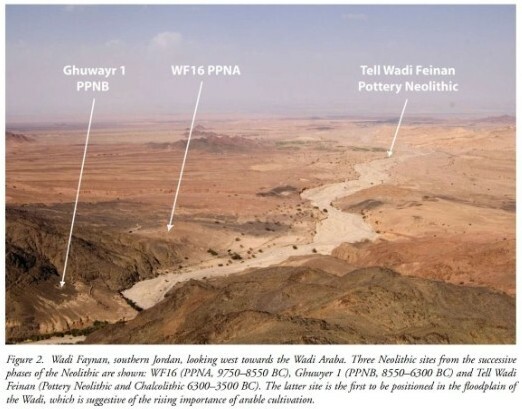 Furthermore it appears that the PPNA occupation was focused at one major site -- WF16 -- and the same pattern occurred in the PPNB at Ghuwayr 1 and the Pottery Neolithic at Tell Wadi Faynan. There is a probable increase in the number of small sites during the Chalcolithic.